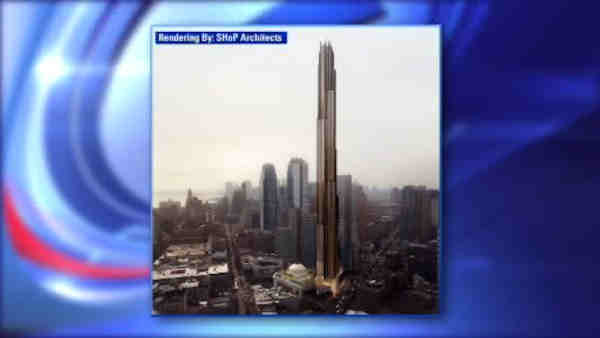 DOWNTOWN BROOKLYN -- New York City has approved a proposal for a 1,000-foot skyscraper in Brooklyn. The tower would be nearly twice as tall as any other building in the borough. The New York City Landmarks Preservation Commission approved the proposal for the 73-story apartment tower on Tuesday. The design by SHoP Architects calls for 500 units and a tapered and hexagonal form clad in bronze and black metal fins. The New York Times says the tower will be built on a portion of the neighboring Dime Savings Bank of Brooklyn, a city landmark. That allows the project about 300,000-square-feet of air rights. Because the 1908 bank is a landmark developers needed city approval to alter the bank, which will house new shops.